It’s been a long while since my last post, and with good reason – I’ve been on leave. Normally during leave when I’m not actually going away, I’ll try to squeeze in some overtime around whatever I’m doing in my time off, but this 2 weeks, I did nothing remotely ‘ambulancey’. It was great! It’s very easy to get wrapped up in this job, even when you’re not sat in your uniform, you may well be thinking about a job or discussing work with a friend. It’s hard to escape but I managed it (all bar a couple of emails to officers about 1 or 2 important things). So, back to it yesterday. My favourite crew mate (I have to say that as he reads this blog) at my base station – should be a nice way to return after a relaxing break. First shout was at a Doctor’s Surgery given as “7 year old, unconscious, fitting”. That gets the adrenaline pumping when you’ve had no exposure to emergencies for a while! This child had stopped fitting in the 3 minutes it took us to get there, and was being seen to by the GP who had given him Oxygen. The child still had a reduced level of consciousness so my crew mate went immediately to get the stretcher from the ambulance. Once aboard, we gave him a thorough check which revealed a very high temperature (of unknown origin), which could’ve brought on the seizure. Either way, he was going to A&E for assessment. That job was nice and tame compared to the rest of the day. Next job was a public cardiac arrest. Cardiac Arrests can be (organised) chaos at the best of times and this was no different. An elderly male walking to a car and collapsed. His heart had stopped and he was not breathing. We arrived in under 5 minutes to find a member of the public performing good quality CPR as instructed by our 999 Emergency Medical Dispatcher over the phone. Always a tricky situation this. Protocol dictates a certain order of things that need to happen. CPR was initiated and continued by my crew mate while I cut the man’s clothes off to apply the defibrillator pads to his chest. His heart rhythm was Pulseless Electrical Activity (PEA). This means that the electrical component of his heart was working, but the muscle (the bit that physically pumps the blood around) had failed and stopped. This is not a rhythm we can shock back to life. From here, the airway should be secured and ventilations should begin to breathe for the patient. However, this was a very public arrest so we needed to get him into the ambulance before any of this could really take place – for dignity more than anything. Also as he was wedged between two parked cars, it was not the ideal location to perform Advanced Life Support (ALS). My crew mate continued CPR and even managed ventilations while I called for Priority backup on the radio for another pair of hands and grabbed the trolley and a special scoop stretcher that splits into two and allows us to literally ‘scoop’ a patient off the floor keeping them flat. The patient was large. And heavy. This meant that the lift with just the two of us was a challenge. But at times like this, you draw from the adrenaline and get it done. As we loaded him onto the ambulance, our backup arrived. Out of public view, and with three of us, we could begin ALS. Gaining IV access to give a cocktail of drugs to try to ‘jumpstart’ the heart, while performing CPR. However, we had a pretty big problem. We struggled to secure his airway (by this I mean maintain an open and clear airway so that we can ‘breathe’ for the patient without occlusion from vomit, blood etc). He was losing large quantities of blood through his airway. Despite using our suction machine to clear it, it just kept pumping out with every compression off the chest. We have various pieces of equipment to try to secure an airway, and none of them were working. We tried everything in our arsenal but this man had a catastrophic internal bleed which made it very difficult. We were very close to our local A&E, so a very quick phone call to ensure they were ready for us, and we ‘blued’ him in. It’s the first time I’ve done CPR in the back of a 5 ton ambulance doing 50mph through a city – it’s not easy! We arrived at A&E in a little under 10 minutes, continuing ALS the whole time, including while walking into the department. For another 10 or so minutes, the Doctors and Nurses fought to save this man’s life, but sadly nothing further could be done. With every one’s agreement, life support was ceased. The Doctors thanked everyone for our help and thanked us for our hard work leading up to the patient’s delivery to A&E. There’s always a few seconds of quiet after death is declared. I looked at the man’s eyes, now glazed and fixed, and felt a little sad that we had no idea who he was. Later, the nurses found a wallet with his ID, so his family could be notified. 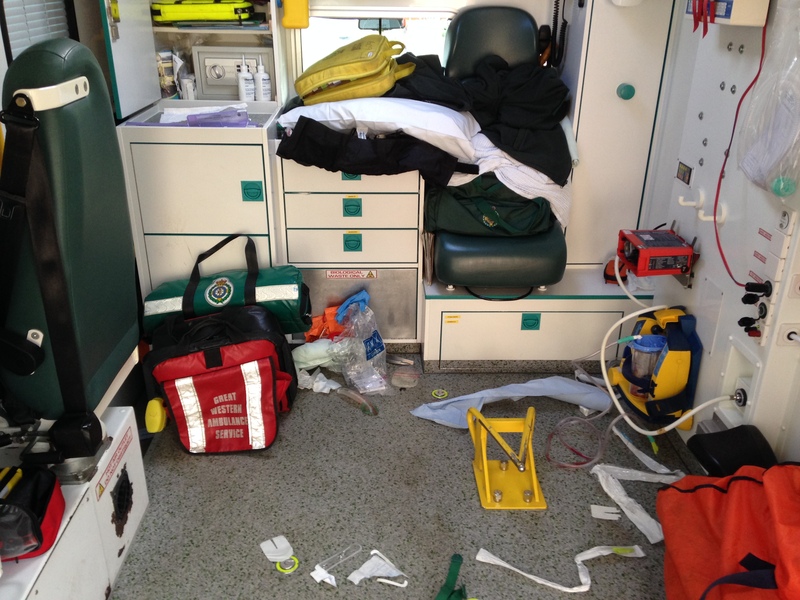 The mess after a cardiac arrest is substantial. Here’s a photo of the back of the ambulance after the call. Bear in mind that half the kit was still in the hospital. Lots of cleaning after a job like this is needed. Our very next job (after returning to station and restocking the mountain of kit) was a young lady who’d been found dead by her son. She’d been dead couple of days and was in quite a distressing position. There was nothing we could do, so we contacted the Police to act as coroner (standard practice in an unexpected death). I feel sorry for the son, who lived with his mum, and due to being at work and out with friends, had no idea that his mum was dead. We left him in the care of the Police, as there was nothing further for us to do. Our final job seemed like a routine backup for a Rapid Response Car on scene with a patient who’d had a seizure. All good, until she started to have another fit in the back of the Ambulance on the way to A&E. “Put the lights on, Stu”, came my crew mate’s voice from the back. I pulled in briefly to give him a hand securing IV access and maintaining her airway then drove under emergency conditions to A&E. A heck of day, filled with medical emergencies that really made me think and tragedies that also made me think. I text my mum, and fiancé reminding them that I love them.